It is pretty obvious that I like to constantly buy new lip products, but hey, I have a beauty blog so it’s okay, right? I hope so. Anyway, I love a good pigmented lip product, which is why I purchased some matte lip tars from Obsessive Compulsive Cosmetics– love the name! Pagan| This is a dark deep purple, almost black, shade. I was really excited to try this out because it is such a witchy shade, and you know how I love any and all things witchy, but this is really hard to pull off, at least for me it was. It also made my teeth look really yellow, which is not the kind of witchy I prefer. Black Dahlia| This is my all time favorite OCC lip tar that is a dark, vampy, raspberry shade. I absolutely adore this color and even though it’s a pain to put on, I love it unconditionally! This lasts on my lips for at least six hours before fading and once it does, it leaves behind a gorgeous berry toned stain on the lips. Anita| This is a brown shade with slight red undertones, and appears more brown when applied, at least on me. The consistency of this one was thinner, which made it harder to apply. Personally, I thought this looked really bad on me, but if this type of shade is for you, go for it! Sebastian| I’ve never seen a shade quite like this, but this is a gray, taupe shade with slight plum undertones. This is definitely not an everyday color for me, but it would be great for potential Halloween looks. When I tried this out, it made me look extremely dehydrated and dead so I had to give this back. Hoochie| When I was going through my neon purple shade, I was obsessed with this color. This is a very vibrant purple with pinky tones. I think this would look great on every skin tone if you enjoy bold colors on your lips. This lasts a long time, and leaves a gorgeous stain on the lips. 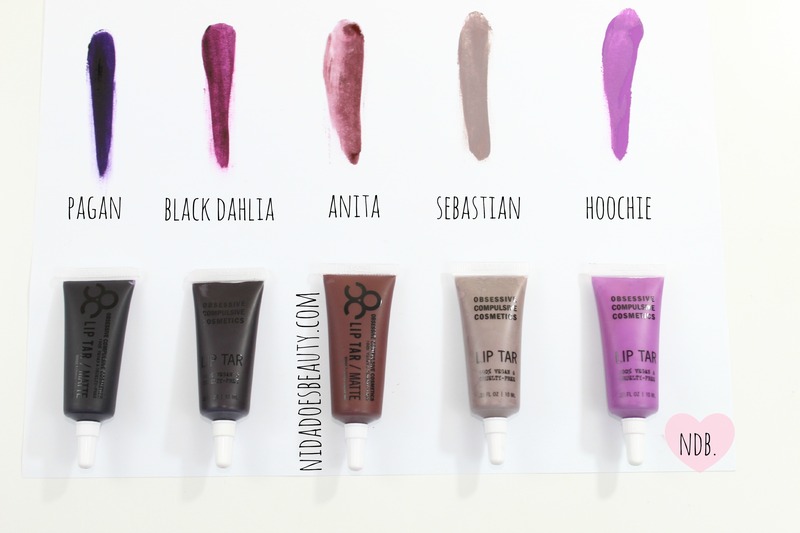 Swatches of the matte OCC lip tars. The Good| These lip tars are extremely pigmented, which is great for someone who really looks for color payoff when they are deciding which lip product to purchase. You only need a small, and I mean tiny, amount of product since it is so pigmented, which means every tube will last you probably your whole life. It could become a family heirloom you pass down to each daughter– that is how long it will last you. An upside is that this range has so many shades that you more than likely will find a color you love. Another positive aspect of these is that the darker shades last a long time on your lips, leaving behind a stain. 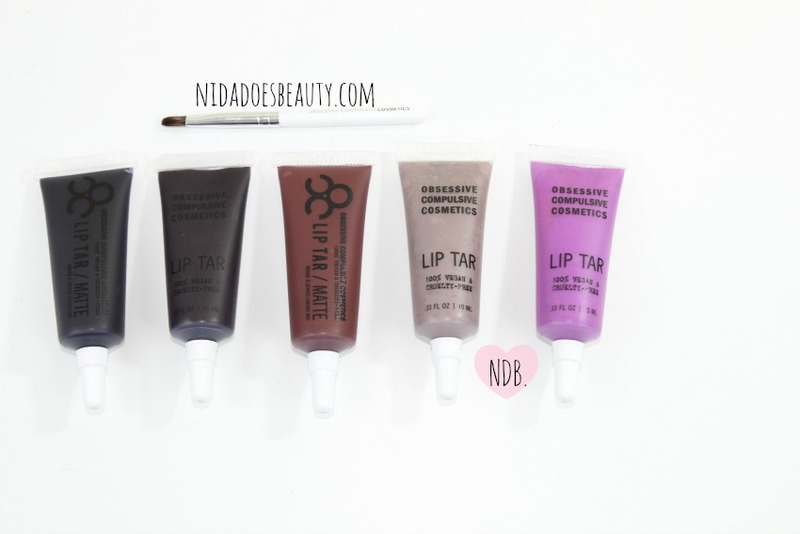 The Bad| Although the pigmentation and opacity is there, these lip tars do have quite a few negatives. First, the consistency is very liquidy, which makes it hard to apply, even with the given lip brush. I like a nice crisp edge when I apply my lipstick because I don’t want it to look as if I’ve just smeared it all over my lips like a five year old. If that’s the look I was going for, I would just ask a kindergartener to finger paint my lips. These darker colors tend to bleed and feather at the edges sometimes even with a lip liner. Their website says to prime your lips and use their anti-feathering lip pencil, but that’s just doing too much. If I’m going to spend $18 on a lip tar, I don’t want to spend another $20 just to make the lip tars “work.” Second, the packaging makes it very difficult to apply. Since the consistency is very liquidy, the tube these lip tars come in causes you to squeeze out too much product and then you make a huge mess. The Verdict| Even though these are extremely pigmented, and there are a lot of shades to choose from, I found that these had some downsides. These lip tars tend to be really messy and you really have to have some time and patience when you want to wear them. If you care more about pigmentation above anything else, these will be great for you. However, if formula, consistency, packaging and all those other elements matter to you more, I would skip on these. Unless of course you cannot live without one of the shades they offer; I can’t live without Black Dahlia, which is one of my favorite vampy lip shades, so I love it regardless of how hard it can be to use. I love wearing it during the fall and winter seasons, but I really wish it was easier to apply. Then, I would probably wear it more often than I actually do. If these were easier to apply, I would have definitely given them a higher rating! Have you tried these? What are your thoughts? Let me know in the comments!